One of a set of 12 reward cards printed by Kronheim & Co. and published by the Religious Tract Society c, 1855. Each card features three Kings/Queens and contains details of each on the reverse together with notable events during their reign and notes of other prominent persons. 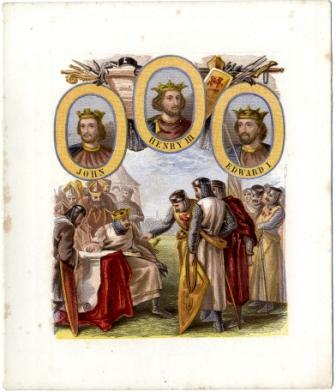 This card features John, Henry III, and Edward I. Each card measures 15.5 x 13 cm. and the set was contained in a wrapper.